Rolf Sieker was one of the first 5-string banjo players in Europe. In 1975 he recorded the very first bluegrass album in Germany. In Europe Rolf played with Bill Monroe, Byron Berline, Dan Crary, Mark O’Connor, Dave Dudley, Bill Clifton and many more. Now living in the US he won the Texas State Banjo Championship in 2001. He recorded studio sessions with Ray Benson & Asleep At The Wheel, Kelly Willis, Bill & Bonnie Hearne, Dale Watson, Red Volkaert, Trace Atkins, Rod Moag, Julie Chadbourne, Lantana, Bruce Robison, The Carper Family, Malford Milligan and many others. 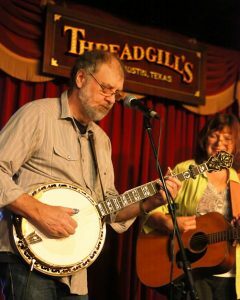 Rolf also played with Bob Schneider’s Texas Bluegrass Massacre which was named ‘Best Performing Bluegrass Band’ at the 2008 and 2009 Austin Music Awards. His way of playing the banjo is highly influenced by the blues-melodic style of Bobby Thompson, one of the most requested studio musicians in the 60s, 70s and 80s in Nashville. The two were close friends and Rolf received Bobby’s banjo in 1996. Rolf is a creative songwriter. For The Siekers he wrote a lot of original material.